"Friendly, clean and great breakfast!" The staff was very friendly upon arrival. They just got new beds which were very comfortable, I slept very well. Great room and price, we will definitely stay here again! Thanks! 08-Apr-2019 Verified Review, stayed from Fri Apr 05 to Sat Apr 06 2019 at a $164.00 average nightly rate. Welcome to the new Holiday Inn Express at Los Angeles International Airport, opening August 2009! We are only 5 minutes from LAX airport and for your convenience we offer a direct complimentary shuttle between LAX airport and our hotel.Conveniently located to all of Los Angeles' most popular business and leisure attractions you are within minutes from downtown Los Angeles, the Convention Center, the new downtown LA Nokia Center, Disneyland and Universal Studios. Local area businesses include Raytheon, NCR, Microsoft, Oracle, GE, and Xerox. We offer complimentary Wi-Fi throughout the hotel! Our 24-hour fitness center is sure to help you stay fit. Our meeting space will meet your needs for that important business meeting. Whether you are here for a vacation or business trip, when it's time to relax enjoy our crystal clear pool and Jacuzzi to let the tensions of the day melt away. Our 160 fresh and inviting guest rooms and suites feature the latest amenities to help you feel at home and our friendly knowledgeable staff will bring ease to your travels.Start your morning smart and checkout the free hottest breakfast bar in town featuring hot items and our delicious cinnamon rolls. Whether you're coming to Los Angeles for business or pleasure the new Holiday Inn Express at LAX is here to meet and exceed your hotel needs. 24 hours prior to arrival for individuals. 10 days prior for groups. Los Angeles International Airport( LAX). Hotel is located 2 miles north of the airport. Hotel offers complementary trasportation to and from the airport. A fee of $5.00 per person round trip aplies for groups of 5 or more persons. Taxi fee is $20.00 one way. 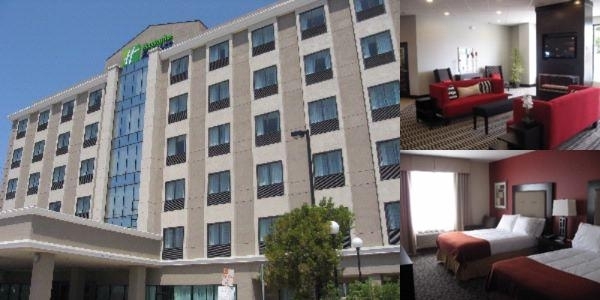 Below are the meeting, banquet, conference and event spaces at Holiday Inn Express Los Angeles Airport. Feel free to use the Holiday Inn Express Los Angeles Airport meeting space capacities chart below to help in your event planning. Hotel Planner specializes in Los Angeles event planning for sleeping rooms and meeting space for corporate events, weddings, parties, conventions, negotiated rates and trade shows. 54 x 30 x 30 Ft.